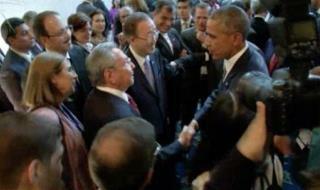 (Newser) – A simple handshake is making big headlines tonight—because the handshakers were President Obama and Cuba's Raul Castro. Reuters quotes a White House official as saying the men shook hands and exchanged some brief chit-chat in Panama during the opening ceremony of the Summit of the Americas. "This was an informal interaction and there was not a substantive conversation between the two leaders," says the official. The two men are expected to meet again tomorrow to discuss the nations' warming ties. Obama is placing a mark in a history book, that's all.....More decent people need to get out and vote, to off set the racists vote, so future presidents aren't elected due to Race. I wouldn't put too much into it. He shakes hands for a living. Lowlifes of many countries have shook his hand.